A one-time price of $0.70 will be added to your order. may be vibrating loose. Checkpoint indicators are a highly visible, highly durable, generally reusable, visual system that snaps on the hex heads of threaded fasteners. Use inside or outside, in any weather conditions, on fixed or mobile equipment. 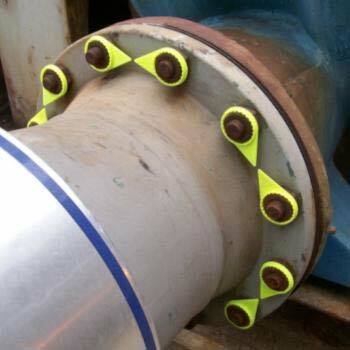 Save time and money and prevent failures and leaks the easy way with Checkpoint indicators. Just tighten and properly torque your threaded fasteners and snap a Checkpoint indicator on each bolt or nut. Align them pointing to each other or all pointing to the center and walk away. When making rounds, anyone (even visitors) can see if the fasteners have started vibrating loose without the use of a wrench.